In a sense, the DVD era has already entered a new phase: just as a proliferation of reissues of older recordings appeared on CD shortly after the dawn of the silver disc in the 1980s – many of them historic opera performances from the 1930s, '40s and '50s – now too has the practice of releasing older material reached DVD. But there is a crucial difference in the DVD venue: most of these older recordings were never available on record, but were taped for television; and those that may have gained currency in the marketplace were likely produced for limited distribution on VHS tape, not exactly the most effective venue for good sound reproduction. 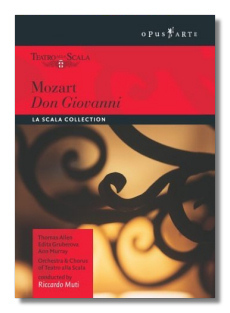 Both the Mozart opera recordings under review here are from older sources, the Don Giovanni coming from a 1987 Teatro alla Scala production, originally recorded by RAI Television, and the Le Nozze di Figaro a Glyndebourne Festival performance recorded by Southern Television (Great Britain) in 1973. Thus, what we have here are two "new" old recordings that enable you not only to hear your favorite singers of the past but to see them in high-quality productions. But there's a price to pay – the sound quality, as you might suspect, is not anywhere close to DVD standards of today. In fact, though the sonics are quite listenable here, they do not quite compare favorably with other recordings made during their time. That drawback aside, these are both fine efforts that should appeal to admirers of these two operas and their stars. 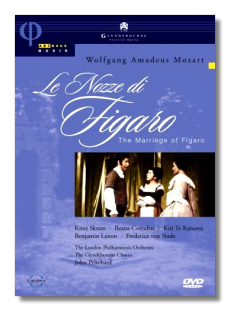 Le Nozze has the bigger cast here, of course, with the magnificent female trio of Cotrubas, Te Kanawa, and von Stade, all in fine voice. The little-known but talented Knut Skram (whatever became of him?) is also quite impressive in the role of Figaro, and veteran British baritone Benjamin Luxon is absolutely delightful as Count Almaviva. The production by (now Sir) Peter Hall is fabulous, in the end making you wish that the whole thing could have been captured in more up-to-date sound. But let me emphasize, before I scare off potential buyers, the recording is quite listenable and the sonics are NOT a major drawback. Your ears should adjust quite comfortably. John Pritchard, probably one of the more underrated opera conductors of his era, draws fine playing from the London Philharmonic and fine singing from the Glyndebourne Chorus. There are eighty-seven tracks provided by Arthaus for easy access of almost any significant point in the opera. An absolute delight – highly recommended! As for the La Scala Don Giovanni, I'm not quite as enthusiastic – not that it is bad or even mediocre. It's a solid performance, with Thomas Allen turning in a fine Don Giovanni and Edita Gruberová lovely as Donna Anna. In fact, the whole cast is quite good, as are the Muti-led orchestra and chorus. But the production isn't nearly on the colorful and imaginative level as the Glyndebourne Le Nozze, and there are only twenty-four tracks provided by Opus Arte. Moreover, many lines are missed – really, ignored – in the English subtitles. Still, you won't be shortchanged by this performance, even if it isn't quite top-drawer in performance and sound quality.